In this article, I’ll show you how to sign up for Straight Talk wireless and how to check if you can use your iPhone 6s or iPhone 6 with Straight Talk’s Unlimited Talk, Text, and Data Bring Your Own Phone(BYOP) Plans. I have divided the article into ten parts to show you the complete process. 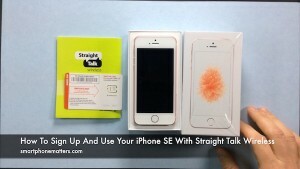 Do you have an iPhone 6s or iPhone 6 and want to sign up for Straight Talk Wireless? Don’t understand how it works or know how to sign up? In this video I’m going to tell you what you need to know and show you how to sign up. Now I have the iPhone 6 here, but all the all the information and steps in this video will also work for the iPhone 6s, iPhone 6s Plus, and iPhone 6 Plus too. And going forward, I’ll just say iPhone to refer to one of those four models. When you sign up for Straight Talk you’ll have the choice to buy your iPhone directly from Straight Talk or use the iPhone you already have. If you want to use your iPhone, you’ll sign up for Straight Talk’s Bring Your Own Phone Plan or BYOP plan for short. You can also buy an iPhone directly from Straight Talk, if you don’t have one. Straight Talk sells both the latest as well as previous model iPhones at a variety of price points. They often have reconditioned iPhones that are more affordable. Not every iPhone for sale from Straight Talk is the best deal at any given time, but the available models and prices change over time. Use one of the links below to see what Straight Talk currently has to offer. The first thing you should do when you sign up for Straight Talk Wireless is pick the network you want to use. Straight Talk didn’t build their own cellular network, instead they use the AT&T, Verizon, Sprint and T-Mobile networks. When you sign up you are Straight Talk’s customer, but your iPhone will use one of those networks. Pick the network that has the best coverage in your area. If you are currently an AT&T, Verizon, Sprint or T-Mobile network customer and are satisfied with the network coverage, hen choose the same network when you sign up for Straight Talk. Note that I don’t have experience using Straight Talk’s Sprint network and I have have little feedback from smartphonematters readers about using the Sprint Network. So consider this information a guideline. And if you want to sign up for Straight Talk and use the Sprint network, I’d like to hear from you. When I asked Straight Talk and they told me that if you want to use your iPhone with Straight Talk’s Sprint network, the phone must be eligible and you must have your Sprint SIM card still in the phone to get 4G LTE service. Straight Talk does not sell Sprint compatible SIM cards. Part 2 – Will Your iPhone Work? Let’s fill in this table looking at the way most customers with an iPhone would sign up for Straight Talk’s BYOP plan. Straight Talk expects that iPhone customers will use the same network they are currently using when they switch to Straight Talk. And, because of this your phone will work that same Straight Talk. If your iPhone is from AT&T it will work with Straight Talk’s AT&T network whether the phone is locked or unlocked. Your iPhone is “locked” when your wireless company has prevented you from using your phone on another wireless companies network. If your AT&T iPhone is locked, it is not going to work with Straight Talk’s Verizon, Sprint, or T-Mobile network. If its unlocked, you can use it on the Straight Talk’s T-Mobile network or Straight Talk’s Verizon network If it is eligible. It will not work with Straight Talk’s Sprint network. If your iPhone is from Verizon it will work with Straight Talk’s Verizon network if the phone is eligible. Later, I’ll show you how to find out if your phone is eligible, by checking your iPhone’s serial number online at straighttalk.com. All Verizon iPhone 6 models were sold by Verizon unlocked so I’ll just will in the table for unlocked iPhones. Your Verizon iPhone will work with Straight Talk’s AT&T or T-Mobile network. It will not work with Straight Talk’s Sprint network. If your iPhone is from Sprint it will work with Straight Talk’s Sprint network if the phone is eligible. If your Sprint iPhone is locked. It’s not going to work with Straight Talk’s AT&T, Verizon, or T-Mobile networks. If it’s unlocked, you can use it with Straight Talk’s AT&T network or T-Mobile network. You can use it with Straight Talk’s Verizon network if its eligible. I asked Straight Talk and they told me that if you want to use your iPhone with Straight Talk’s Sprint network, the phone needs to beeeligible and you’ll need to have your Sprint SIM card still in the phone to get 4G LTE service. Straight Talk does not sell Sprint compatible SIM cards. Note that I don’t have experience using Straight Talk’s Sprint network and I have have little feedback from smartphonematters readers about using the Sprint Network. So consider this information a guideline. And if you want to sign up for Straight Talk and use the Sprint network, I’d like to hear from you. If your iPhone is from T-Mobile it will work with Straight Talk’s T-Mobile network regardless of whether your phone is locked or unlocked. If your T-Mobile iPhone is unlocked it will work with Straight Talk’s AT&T network. If the phone is unlocked, it will work with Straight Talk’s Verizon network if the phone is eligible. It will not work with Straight Talk’s Sprint network. If your iPhone 6s Plus, iPhone 6s, or iPhone 6 Plus or iPhone 6 is from a wireless company other than AT&T, Verizon, Sprint or T-Mobile, you still may be able to use it with Straight Talk Wireless. Oscassionally someone asks me aout using a US Cellular iPhone with Straight Talk. To use your iPhone with the Straight Talk AT&T or Straight Talk T-Mobile network, you’ll need to check that Straight Talk has coverage on one of those networks in your area and your iPhone needs to be unlocked. 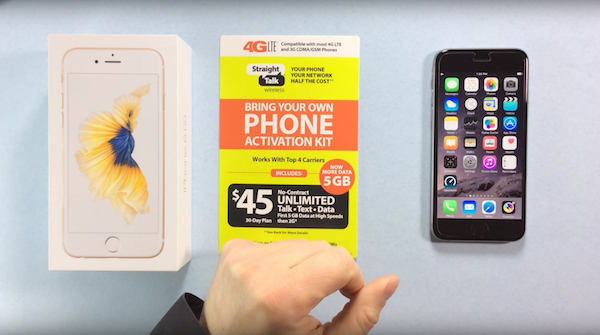 You can use your iPhone 6s Plus, iPhone 6s, iPhone 6 Plus, or iPhone 6 from another wireless company with Straight Talk’s Verizon network if your phone is eligible. You can check if your iPhone is eligible on straighttalk.com. You’ll enter your zip code and phone’s serial number, called an IMEI and Straight Talk will tell you if your iPhone is eligible. Many people ask me if they can buy the SIM-free iPhone 6s Plus, iPhone 6s, iPhone 6 Plus, or iPhone 6 directly from the Apple Store and use it with Straight Talk’s BYOP plan. Yes, you can. “SIM-free” is what Apple calls their full price, “contract-free”, “factory unlocked” model phones. The SIM-free models work with Straight Talk’s AT&T or Straight Talk’s T-Mobile network. They will also work with Straight Talk’s Verizon network if they are eligible. Now it’s time to pick your Monthly plan. With Straight Talk you’ll have a choice of a $45, $55, and $60 Monthly plan. All plans come with unlimited nationwide talk, text, and data. The $45 plan includes 5GB of High Speed data. The $55 plan includes 10GB of high speed data. That’s double the amount than the $45 plan for $10 more. The $60 plan comes with 5GB of high speed data but also includes international calling. All monthly plans are 30 days. Note while the data is unlimited, you will be reduced to 2G data speeds for the rest of the month after using up your first 5 or 10GB of data. With 2G data speeds you may be able to check email or send a message. Don’t expect to listen to streaming audio or watch video with 2G speeds. Many users say they find 2G speeds unusable. The $60 plan offers international calling. Make sure to check straighttalk.com to check the terms for which countries and numbers you can call as well as the terms for calling mobile and landline numbers. They are t updated over time so straighttalk.com is the best source for the most up to date information. Note straight talk does offer a $30 plan but it cannot be used with the BYOP plan. They also offer discounts for 3 month, 6 month, and one year plans. I generally would not recommend these plans for someone just signing up as you are prepaying for months of service that are non refundable if you decide you are unhappy with the service. Finally, I want to point out that unlimited text messages does not include MMS picture messages and group messages. While these features work just fine for many, Straight Talk will not guarantee they work with your BYOP plan iPhone. Now that you have picked your network and your plan. It’s time to order a SIM card and monthly plan. You can buy these in Walmart or order them directly online from straighttalk.com. When you you order online you’ll only pay for the SIM card you need and you’ll be able to pick the Monthly plan you want to. As part of ordering online, you’ll confirm that the network you want to use is available in your area, and that your phone is eligible if you want to use the Verizon or Sprint networks. When you order your SIM, pick the one for the network you want to use and the size that fit’s your phone. All iPhone 6s and 6 models use a nano SIM. This is what the AT&T nano SIM card looks like. This is what the T-Mobile nano SIM card looks like. This is what the Verizon nano SIM card looks like. If you want to use the Verizon network you’ll also need a network access code. The network access code is a PIN printed on a paper card. You’ll scratch off that silver stuff to reveal the PIN number. You’ll use the PIN number to register your phone on Straight Talk’s network as part of the activation process. If you want to use the Sprint network. You’ll need to still have your existing Sprint SIM in your phone. Straight Talk doesn’t sell Sprint compatible SIM cards. And If you want to use the Sprint network you’ll also need a network access code I just showed you. Finally I wanted to show you want a different size SIM card looks like. This is AT&T Dual SIM card. This SIM is too big for the iPhone 6. You’ll see its much bigger than the nano SIM. you would use this SIM card with phones that use a standard or micro SIM card. In addition to the SIM card, you’ll need a monthly plan. This card is for the $45 Monthly plan. You’ll see there is some silver stuff you’ll scratch off with a coin to reveal the service pin which you’ll enter online to activate your first month of service. Click the ORDER YOUR STRAIGHT TALK AT&T SIM CARD button above. Choose the SIM Card or the SIM card with the Monthly Plan you want. Enter your Shipping and Billing Information and complete your order. If the Straight Talk AT&T network is not available in your area, you will never make to Step 7. If you look carefully you’ll see the error message: “We’re sorry. Service is not available in the Zip Code you provided. Please enter a different Zip Code or call our Customer Care Center for further assistance. Click the ORDER YOUR STRAIGHT TALK VERIZON SIM CARD button above. Choose CDMA LTE Activation Kit or the CDMA LTE Activation Ki with the Monthly Plan you want. To order the Straight Talk T-Mobile nano SIM card. Click the ORDER YOUR STRAIGHT TALK T-MOBILE SIM CARD button above. If the Straight Talk T-Mobile network is not available in your area, you will never make to Step 7. If you look carefully you’ll see the error message: “We’re sorry. Service is not available in the Zip Code you provided. Please enter a different Zip Code or call our Customer Care Center for further assistance. Now I am going to show you how to sign up for Straight Talk’s Sprint Network. I want to share with you up front that I have signed up for Straight Talk’s Sprint network myself, so I am going to show you how to do this the best I can. The steps are a little different than signing up for Straight Talk’s AT&T, Verizon, or T-Mobile networks. From my article on smartphonematters.com, scroll down the the sprint section. Now Straight Talk will check your Zip code to make sure they have Sprint service in your area and check your IMEI to make sure your phone is eligible for use on their Sprint network. I’m not sure if those instructions are correct. Straight Talk doesn’t sell Sprint compatible SIM cards. To be eligible, you either need to have the original SIM card in it or a built in SIM card. Some Sprint phones have built in SIM cards that you cannot remove. To register your phone with Straight Talk, you are going to need a Network Access Code. If you click the REGISTER PHONE NOW button, I think they will have you buy the network access code and then active your phone. I am not sure how much they are going to charge you for the Network Access Code, it might be free, or $0.99 or $6.99. If it’s $6.99, you’d be better off buying the CDMA LTE Activation Kit. That kit will have the Network Access Code and Verizon LTE SIM (which you don’t need to use). To find out how to order the CDMA LTE Activation Kit, watch the Order the Straight Talk Verizon SIM card video. Before ending the video, I show you what straighttalk.com looks like if your iPhone is not eligible or compatible with Straight Talk’s Sprint network. This time I check the iMEI from my iPhone and straighttalk.com displays the message: BYOP not compatible. Once you have your nano SIM card and Monthly Plan Service PIN. You can sign up to use your iPhone 6 with Straight Talk. I’m going to show you how to sign up for Straight Talk’s AT&T network. The steps are the same for Straight Talk’s T-Mobile network. The steps are slightly different for Straight Talk’s Verizon and Sprint networks. Check my article on smartphonematters.com for more information. If you want to keep your phone number, you’ll need to know the account number and PIN code for your current phone company. If you don’t know them call your phone company and ask. Note, that your account PIN is not the number you enter to unlock your phone’s home screen. On the next page, there are four options. Two of these options are for new Straight Talk customers. Next, enter the last fifteen digits of your SIM number, that’s the second group. You’ll find that number on printed on your nano SIM’s plastic card. Note that you enter the SIM number here if you are using the Straight Talk AT&T or T-Mobile SIM card. If you are signing up for Straight Talk’s Verizon or Sprint network, you’ll enter your iPhone’s serial number or IMEI here. The SIM number is long so enter it carefully. Now you’ll see a popup message with some additional information about signing up. You can decide if you want to read through it. Enter your Monthly plan service PIN. You’ll need to scratch off the silver stuff on your Monthly Plan card. At this point you can choose to create a new account on straighttalk.com or log in to you existing account. If you use your existing account, this phone will be listed with your other Straight Talk phones. I’m going to create a new account. This next page gives you a lot of information about moving your phone number to Straight Talk. Number Portability or Porting, is just fancy telephone company talk for moving or transferring your number. You can decide if you want to read through the details. Once your transfer your number to Straight Talk, your other phone company’s account is automatically canceled. Don’t cancel your service with that phone company before transferring your number. Your Date of Birth, I always use a fake birthday. There are two options for additional options about receiving offers from Straight Talk and their partners. You can decide if you want to check them. Enter your email address. This email address will be used as the login for your straighttalk.com account. enter a 5 digit security pin for your account. You might want to write that down. And last, you can add a nickname for this phone. That sometimes helps if you have more than one phone in your account. This is optional. I’m going to enter iPhone 6. At this point, you wait. You should put your SIM into your phone. Straight Talk says it could take up to 24 hours for your number to transfer. Now, I ‘m going to click Account Summary. This is what your Straight Talk Account will look like when you log in. At this point, I am going to wait for my service to transfer and I’ll continue the video. After I signed up and transferred my phone number to Straight Talk I waited about four hours. During this time my Net10 phone continued to work. My new Straight Talk SIM had no service. Finally I called Straight Talk to make sure their wasn’t a problem. They reminded me it could take up to 24 hours to transfer and asked me to stay on the line. The customer service rep was typing away on her end and in about 5 minutes my Net10 service was shut off and the iPhone with my the Straight Talk SIM had service. Once my iPhone was activated I checked to make sure it was working. Let me show you. First, check phone calls. I have this other phone here so I’ll call it. You can hear that phone ringing now. Let me hang up. Now check that you can receive calls. I’ll call my iPhone. You can see that call coming in. Next check text messages. I’ll send a text message from my iPhone to that other phone. I’ll say hello. you can see hat message was sent. Now check that you can receive a text message. I Send a text from that other phone to my iPhone. You can see I received it. check cellular data and MMS picture messages. I’m using Straight Talk’s AT&T network so my iPhone automatically set up the Access Point Name, or APN, settings. If you are using the Verizon or T-Mobile network, see smartphonematters.com if you help setting up your APN. make sure you can use cellular data. I have my WiFi turned off. I’ll use Safari to visit smartphonematters.com. You can see it works. Now, Check picture messages. I’ll send an MMS picture message to this other phone. You can see picture picture was sent. Let’s see if the iPhone can receive a picture. I’ll send one from that other phone. And you can see I received the picture.